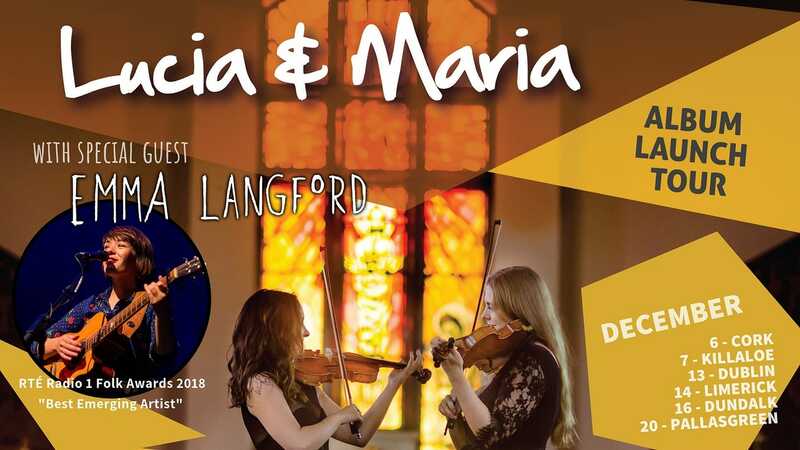 Violin virtuoso duo Maria Ryan and Lucia MacPartlin will be joined by award-winning folk singer-songwriter Emma Langford on their tour of Ireland this December for the launch of their debut album, “Lucia and Maria – Live at the Chapel”. The album was recorded at Griffith College Chapel in Cork as part of the Quiet Lights Festival. Lucia and Maria met while studying in Cork, where they also formed string-quartet Strung. In their compositions and arrangements they combine their traditional, classical and folk influences to stunning effect. The duo completed their Masters’ at the University of Gothenburg, Sweden last year, before returning home to Ireland to record their debut album. Lucia and Maria have embarked on a brand new collaboration with award-winning folk singer-songwriter Emma Langford for the month of December. With songs that dance playfully in that liminal space between folk, jazz and traditional Irish nuance, Emma Langford is described by Ireland’s song-writing legend Phil Coulter as “a breath of fresh air”. Her songwriting has drawn comparisons to the likes of Joni Mitchell, Nick Drake and Joan Baez; her presence and timbre however are truly unique and best experienced live. Her debut album Quiet Giant released at the end of 2017 was described in The Irish Times as ‘music that weaves a spell as you listen to it… An enduring piece of work’.